If you are visiting or moving to St. Charles Township, you have a lot in store for you. The city is beautiful and full of wonderful parks to take walks and relax. While in the area, you should check out Pottawatomie Park, which offer riverside boating and golf, for your enjoyment. If you enjoy wildlife, you should visit James Pate Philip State Park, as this is a wildlife habitat. Unfortunately, tooth pain does not care who you are or what your plans are, but if you do happen to experience tooth pain, you can rest assured that there are many dentists and specialists in St. Charles ready to help you. Emergencydentistsusa.com is committed to helping you find a dentist in your area. We have compiled a list of dentists and specialists for you to view and you can choose the one nearest you. All you need to do to identify a dentist or specialist is view the list. Should you not be able to view the list or you do not have time, call our toll-free dentist finder hotline now. Our team of experienced staff will help you choose the dentist that meets your needs. We can schedule you your first appointment and even provide you with directions to the dentist’s office. We do recommend that you arrive about 15 minutes early to your appointment to fill out new patient paperwork. You should bring a valid form of ID, your insurance card, your copayment, and a list of your current medications and allergies to your appointment. When you need a dentist or specialist in St. Charles, IL, do not hesitate to look for one as you will find that there are many options available to you. As you start to browse for them, you will see that there are general dentists, family dentists, pediatric specialists, orthodontists, periodontists, implantologists, and more. Generally, you will visit a general dentist first and they will diagnose and treat you; however, should they not be able to, you will find that they refer you to a specialist. Description: If you are looking for a comfortable environment for the entire family, Second Street Dental is the place to go. All of our services are designed to provide you with the quality care you need. We know that going to the dentist may not be your favorite thing to do, but we make it fun and informative for you. Doctors: Randallwood Dental is ready to give you and the whole family a reason to smile. We offer routine checkups up to complete smile makeovers for those patients who want to fall back in love with their smile. Our mission is to make sure patients who need to receive care are able to. 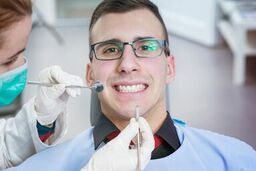 In addition, our team knows how scary it can be to visit the dentist, so we offer sedation dentistry to include nitrous oxide and IV sedation. Description: Randall Ridge Dental is your source for all of your dental needs. All of our professionals from the front office staff to our dentists is trained and experienced. We specialize in comprehensive dental procedures and can provide you with services such as sleep apnea treatment, TMJ treatment, root canal therapy, dental implants, and more. If you are experiencing tooth pain, you may have an underlying condition that is causing it. For example, a dental abscess can cause a lot of pain and so can tooth decay. If you have been in pain for more than a couple of hours, you should seek out emergency dental care in St. Charles. If you have tooth or jaw pain due to an accident you were involved in, it is important for you to visit the ER or urgent care center first to ensure you are not seriously injured. When you visit a new dentist, no matter the location, you should make sure that you check out the dentist’s credentials and make note of whether or not the dentist is licensed to provide the care you need. To do this, simply visit the Illinois Dental Association and search the dentist’s name. You can also look for the dentist’s credentials in the office, as many will hang them in the reception area.